1) Sift in cake flour, molasses sugar, corn flour, baking powder and salt in a bowl and mix well with a whisk. 2) Beat 2 eggs in a different bowl, add fresh milk, vanilla extract and mix well. 3) Add the dry ingredients in (1) 1/3 at a time, and mix till you don’t see any lumps of flour. 4) Add VCO and mix again, however do not over mix. 5) Cover with food wrap and leave to set for 5 minutes. 6) Heat a non-stick frying pan over low flame. 7) Once the pan is hot, use a soup spoon to scoop the batter and place it directly into the pan; cover with lid and cook until bubbles appear on the cake surface. 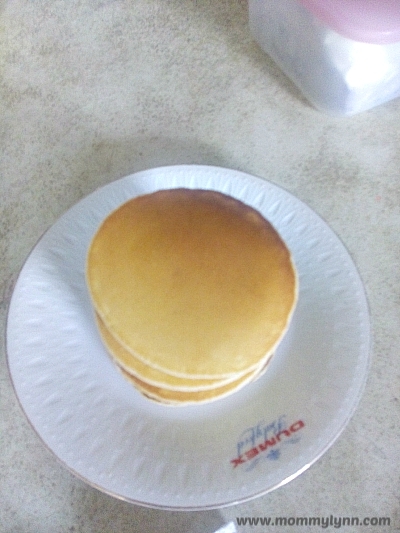 8) Flip the pancake with a spatula and cook for another 1 to 2 minutes or till golden brown on the other side. 9) Repeat the process in method (7) and (8) until all the batter is used up. Cover the pan while cooking the batter and waiting for the bubbles to be formed helps to make it more fluffy. Do you want more recipes for homemade snack? Recipe for baked cereal chicken fillet, click here. Recipe for rice and vegetable pancake, click here.